South Bay farmers are feeling the pain of the drought more than ever after the Santa Clara Valley Water District turned off a major pipeline Thursday. 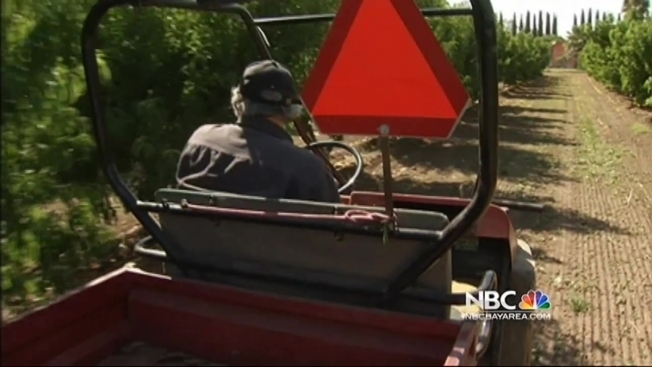 Andy Mariani's orchard in Morgan Hill is one of the farms impacted. Usually, thousands of gallons of water would be flowing, allowing him to irrigate his crops, but now that he has no water, he is forced to rely on well from a nearby farmer. On some days, Mariani said he uses more than 40,000 gallons to irrigate his orchards. He said he is deeply concerned about the future--along with his cherry trees and nectarines. "Our livelihood depends on having water, whereas some of these people just have it for landscaping," Mariani said. "So, what's the more critical need? I don't know. That's for somebody else to judge, but from my own standpoint, I need water to continue in business." This is the first time the water district has cut off his water indefinitely. The water that has been shut off is federal surface water from the Half Road Lateral Pipeline in Morgan Hill. While Mariani said he can get by for now borrowing well water, those wells could go dry at any time, and he wonders how his orchard will fare next year. He has been working at his orchard since 1957.